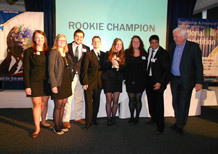 Enterprising students from the University of Exeter have returned victorious as the Rookie Champions at the 2012 annual Students in Free Enterprise (SIFE) competition at Canary Wharf, London on 18-19 April. 48 university teams competed in the 2012 SIFE competition with 38 teams progressing through the regional rounds to the national competition to showcase their projects to a board of over 50 business professionals. Established in October 2011, SIFE Exeter is currently managing eleven projects across the Exeter and Cornwall campuses with 119 team members including students from Humanities, Life Sciences, Engineering and Business. As the only new team to be selected to compete in the opening round of the national competition, they were pitched against established teams that had been running projects for many years. The Exeter team won three accolades for their SIFE projects, which where presented to a judging panel of business experts.